Shinto:Jyosaku ranking:Ryowazamono cutting test ranking:Hizen province. Jyo saku and regular saki)This sword belongs to Jyojyo saki ranking. Habaki :Gold foiled and syakudo double habaki. Blade length : 52.4 cm or 20.62 inches. Sori : 1.0 cm or 0.39 inches. Width at the hamachi : 3.13 cm or 1.23 inches. 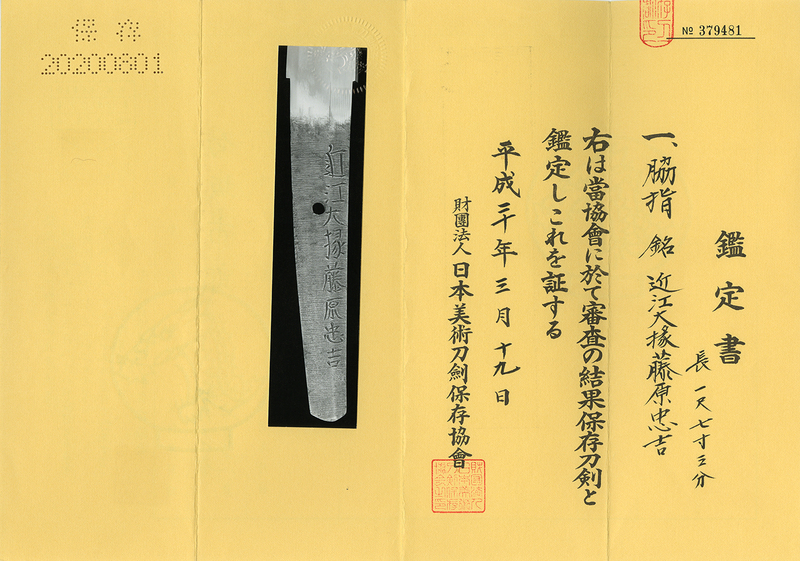 Width at the Kissaki : 2.28 cm or 0.89 inches. Kasane : 0.69 cm or 0.27 inches. Era : Edo period Genroku era. Shape : The blade is wide(3.13 cm) and thick healthy blade. Jitetsu : Koitame hada well grained with jinie attach beautiful texture which is called Hizen Konuka hada. Hamon : Niedeki suguha hamon. Special feature : 3rd generation Mutsu Kami Tadayoshi’s son Hashimoto Gensuke succeeded 4th generation Tadayoshi. He studied from his father 3rd generation Tadayosi and also grand father Tadahiro. At 13 Genroku era, he got the title Oumi Daijyo and added Tadayoshi from his father Tadayoshi. This blade looks 3rd generation Tadayoshi suguha hamon. We recommend this sword for you.